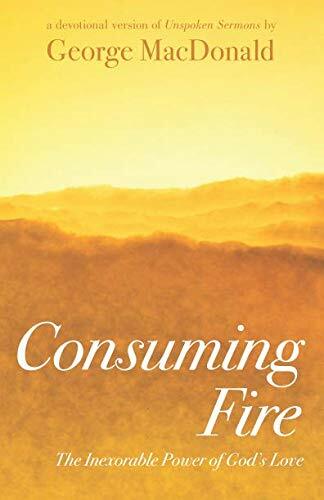 Wherefore, we receiving a kingdom which cannot be moved, let us have grace, whereby we may serve God acceptably with reverence and godly fear, for our God is a consuming fire. The symbol of the consuming fire would seem to have been suggested by the fire that burned on the mountain of the old law. That fire was part of the revelation of God there made to the Israelites. Was this show upon Mount Sinai a device to move obedience, such as bad nurses employ with children? A hint of vague and false horror? Was it not a true revelation of God? If it was not a true revelation, it was none at all. God showed them what was true. He will not put on a mask. He will not speak out of flaming fire if that flaming fire is alien to him, if there is nothing in him for that flaming fire to reveal. Be his children ever so brutish, he will not terrify them with a lie. It was a revelation, but a partial one; a true symbol, not a final vision. No revelation can be other than partial. If for true revelation a man must be told all the truth, then farewell to revelation; yea, farewell to the sonship. For what revelation, other than a partial can the highest spiritual condition receive of the infinite God? But it is not therefore untrue because it is partial. Relative to a lower condition of the receiver, a more partial revelation might be truer than a fuller revelation; for the former might reveal much to him, the latter might reveal nothing. Only, whatever it might reveal, if its nature were such as to preclude development and growth, it would be but a false revelation fighting against all the divine laws of human existence. The true revelation rouses the desire to know more by the truth of its incompleteness. MacDonald is helping us to understand that God never gives a revelation of himself without it being a true revelation, though it is may not be complete. A full revelation of God to man, particularly in our weakened state, might astound us to the point that we would either learn nothing, being in shock, or there would be so much to focus on we would be all over the place, and fail on learning any part of the truth God would have us to see. Partial revelation is necessary for our spiritual growth and development. If there is any truth that we need to know, it is not that God has not revealed it, it is that we are not yet such as to receive it. As the ancient proverb puts it, “When the student is ready the teacher will appear.” Partial revelation helps us to see what we can see at this moment, and until we either grow up into greater maturity or become open to God's kind correction of our present thinking, we can go no farther. There is no revelation of God to man without the accompanying revelation of man to himself. For as God reveals himself, we see who we are in relation to him. Isaiah sees the Lord high and lifted up and says, “I am undone for I am a man of unclean lips.” To Peter, Jesus telling him to cast his net on the other side of the boat and finding the greatest catch of fish he had ever seen was a revelation that Jesus was the Son of God, and he cries out, “Depart from me for I am a sinful man.” Our first look might leave us undone, but God gives us greater revelation of his grace and mercy. He takes us as we are and does not condemn, but gently lifts us from our being gobsmacked at our own failures in light of his revealed goodness and holiness. He keeps revealing more of who he is to us as we can comprehend it and are ready to receive it. George MacDonald's writings are always about revelation, which made him the most visionary writer of his day. Still there are few who compare, and many that cut their teeth in visionary writing by allowing MacDonald to be their spiritual guide into the realm of seeing Christ as they had not seen him before. They, like Lewis, had their minds “baptized by the Holy Spirit,” and the rest is history.